A couple of years ago I spent a pleasant lunch chatting with author Edward Ball about Eadweard Muybridge, who was to be the subject of his next book. A while back I heard that it was to be published by Random House, and the title The Octopus and the Inventor: Eadweard Muybridge, the Killer Who Created the Movies cropped up (the ‘octopus’ being Leland Stanford) but then things went quiet. I notice that Doubleday have now listed the book as forthcoming, with the title The Tycoon and the Inventor. 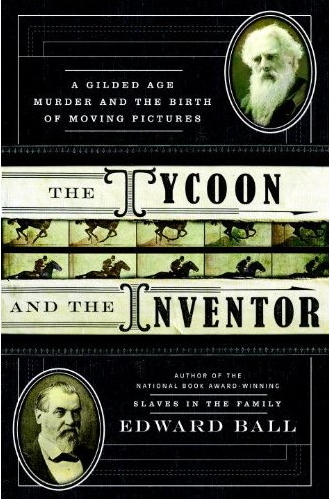 From the National Book Award-winning author of Slaves in the Family, a riveting true life/true crime narrative of the partnership between the murderer who invented the movies and the robber baron who built the railroads. One hundred and thirty years ago Eadweard Muybridge invented stop-motion photography, anticipating and making possible motion pictures. He was the first to capture time and play it back for an audience, giving birth to visual media and screen entertainments of all kinds. Yet the artist and inventor Muybridge was also a murderer who killed coolly and meticulously, and his trial is one of the early instances of a media sensation. His patron was railroad tycoon (and former California governor) Leland Stanford, whose particular obsession was whether four hooves of a running horse ever left the ground at once. Stanford hired Muybridge and his camera to answer that question. And between them, the murderer and the railroad mogul launched the age of visual media. Set in California during its frontier decades, The Tycoon and the Inventor interweaves Muybridge’s quest to unlock the secrets of motion through photography, an obsessive murder plot, and the peculiar partnership of an eccentric inventor and a driven entrepreneur. A tale from the great American West, this popular history unspools a story of passion, wealth, and sinister ingenuity. This entry was posted in 19th-century photography, biography, books, news and tagged 19th-century media, 19th-century photography, Helios, Leland Stanford, moving image, Muybridge, news, photography books.